This study is part of a larger page of sketches from the Young Allies issue I did earlier this year. I don't know when I'll actually finish it, but I'll be sure to post it when I do. 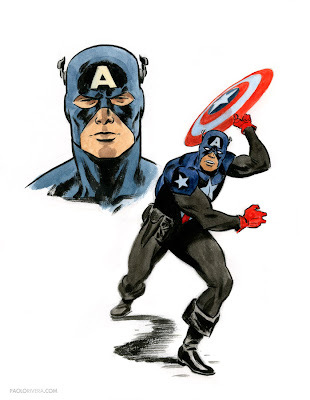 The full figure is a Kirby copy (though his drawing portrayed the original Captain America). I really enjoy doing these types of studies at the beginning of a project — they serve as both motivation and template. I think Jack Kirby would disagree.......wait , Paolo you were Smoking a Kirby cigar while copying this right ?.. SORRY MY ENGLISH IS BAD... WITH AUTOMATIC TRANSLATION IMPOSSIBLE TO COMUNICATE. Creo las poses que dibujaba Jack Kirby, en la mayoría de casos funcionan con el estilo simplificado de Kirby. En mi opinión, Kirby tenia una trazo contundente y duro, usted tiene otro tipo de trazo, más...elegante, funciona mejor con una anatomía bien construida. En este caso, al aplicar su estilo a una pose Kirby, el resultado es incoherente. La manera como coge el escudo, no tiene fuerza, parece que le vaya a caer en la espalda, y si tiene que lanzar el escudo, tiene que impulsar con el torso. Bauxman, thank you for the explanation. And don't apologize for the translation... I'm just glad you care to comment. Ray, even if I did smoke, I couldn't: there's a no smoking policy at Marvel these days. But thanks!